They've been called the most evangelical Cabinet in history—men and women who don't mince words when it comes to where they stand on God and the Bible. They're all hand-picked by President Donald Trump and Vice President Mike Pence. 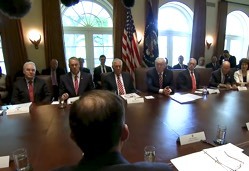 He's started Bible studies in 40 state capitols, a number of foreign capitols, teaches weekly studies in the U.S. House and Senate and now leads about a dozen members of President Trump's Cabinet in weekly studies of the�Scriptures. In Pence, Drollinger sees many similarities to�Biblical�figures like Joseph, Mordecai and Daniel—all men who rose to the number two position in governments at different times in history. "Mike Pence has respect for the office. He dresses right—like it says Joseph cleaned himself up before he went to stand before the Pharaoh," Drollinger told CBN News. "Mike Pence has uncompromising�Biblical�tenacity and he has a loving tone about him that's not just a noisy gong or a clanging cymbal," he continued. "And then fourthly, he brings real value to the head of the nation." 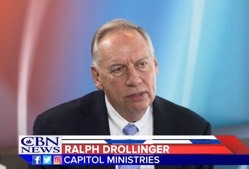 Like others, Drollinger often compares President Trump to�Biblical�strongman Samson.